Not perfect, but this was really fun to work on. Thanks so much for the class. Hi. My name is Ryan Cuthriell and I am a senior art director and designer that splits time doing interactive and traditional print-based design. I have a passion for loud guitars and great branding—so this assignment really strikes a chord with me. I also am a guitar player, having been playing for approximately 20 years. I am designing a poster for Social Distortion (or Social D as some people call them). They are the reigning godfathers of punk rock, hard rockabilly and flat out old rock and roll. 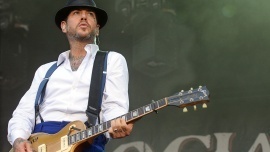 Mike Ness, their frontman, is more than a lyrist, singer or guitar player—when this man speaks, you have to listen. The grit-honesty and hard-luck tales of love lost, love found, and personal heartbreak are just on another level. A lot of their music hits home for me personally, and I can remember moments of my life when I hear their songs. To describe their sound: take the honesty of Johnny Cash, the ferosity of The Clash, the attitude of The Ramones and the aggression of Bad Religion—shake it up and you have Social D. They embody the rebellion of a hot rod and the classiness of Elvis Presley. I've had the pleasure to see them live a few times and it was always amazing. This poster would be from the show I saw them perform last, in Myrtle Beach, at the House of Blues in November of 2012. I did a lot more with the type, actually hand drawing a good bit of it. I also brought in some extra texture. I still need to do a lot of work with the brush and people inside it. I still need to do a lot of work with the brush. Also to bring in a few more elements into the scene. But It's getting there. So, here's my start at getting the the first poster idea in Illustrator. I've found a few references for old vintage sinks and bathrooms. I want to hand draw all the type—I need to definitely incorporate that in place soon. I like the tiled walls in the image below and I'm thinking it might be cool to add that in the background for texture. On the sink can be sissors and an old comb—maybe some hair pomade. We all know toothpaste cleans your teeth and removes the stains and grime. Well, what if the toothpaste was the purity of Social D—bringing the cleanse of pure hard punk-rock to those tight-wad, suit-wearing, no-talent clowns that listen to Kenny G. They'd scream at first but maybe, just maybe, they'd like the taste of real music. *** Maybe the support acts could be written on the mirror with lipstick? This idea is based in their roots—guitars and tattoos. Coincidentally, the word SOCIAL has six words like a guitar has six strings, so I'm using the extra strings coming off the headstock to create the word SOCIAL. The "Distortion" is being delivered by little angels. Visually, this would be bold and somewhat symetrical with tattoo elements around the main visual. One of my favorite and most popular songs by the band, I was thinking of ways to illustrate it. Somewhat unconventionally, I liked the visual of a rooster. Roosters look punk-rock with their crazy colored, mohawked-hair. The have sharp tallons like spikes and (no pun intended) a cocky attitude. I'm visualizing some lyrics from the song here: an empty bottle of gin and the ball and chain. What I think could even make this stronger would be to have the rooster stepping on the bottle having just broken the chain from the ball. The rooster represents freedom from oppression and addiction. I think the words SOCIAL DISTORTION could be displayed semi-transparent over the illustration, maybe like a stamp. Thanks, I'd love your feedback.